NVIDIA's Quadro NVS 420 is quite the unique offering -- on one hand, it's rather intriguing that a workstation card has been whittled down to fit within a small form factor PC, but then again, who else outside of advertisers (and their digital signage applications) will even need it? Nevertheless, said card is the industry's only low-profile professional GPU that can sneak within SFF PCs and still power four 30-inch displays at 2,560 x 1,600 resolution via DisplayPort / dual-link DVI. As for specs, it's boasting 512MB of memory, 11.2GB/sec (per GPU) of memory bandwidth and a CUDA Parallel Computing Processor. It'll be available next month for the niche that needs it at $499. 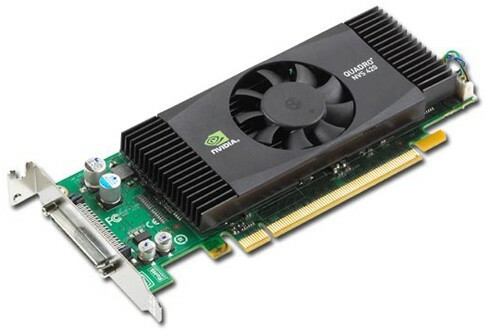 NVIDIA Quadro NVS 420 GPU brings powerhouse graphics to SFF rigs originally appeared on Engadget on Wed, 21 Jan 2009 06:55:00 EST. Please see our terms for use of feeds.